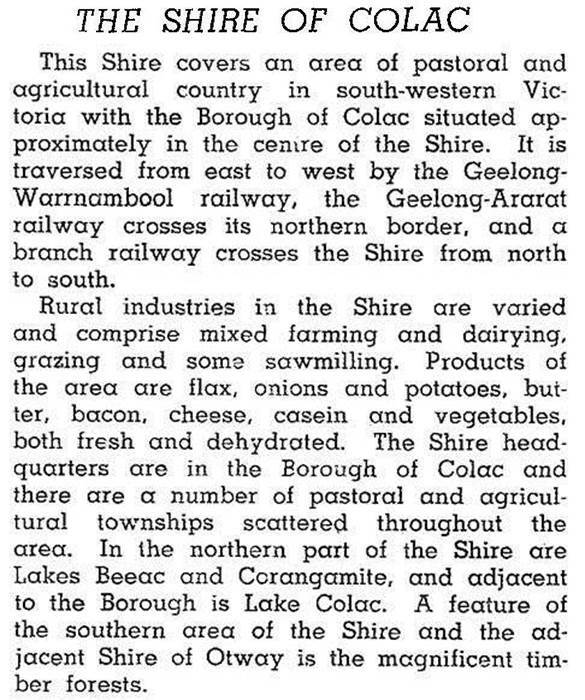 Colac Shire (1864-1994) was in Western Victoria approximately 70 km west of Geelong. Its western border was Lake Corangamite and its area was 1458 square km. When first established on 10 May 1864, the shire included the township of Colac, around which were the shire's most prosperous areas. Southwards there were fertile plains and hilly foothills of the Otway ranges, suitable for grazing and dairying. Northwards, between lakes Corangamite and Colac, a mainly flat, volcanic area, consisting of fertile soil, provided land for dairying and vegetable growing (potatoes, peas and onions). Dairy towns such as Cororooke and Alvie were surrounded by many farms. Further north the plains around Beeac and Cressy had mixed grazing, mainly sheep. Most closer-settlement activity in the shire occurred during 1890-1910, although there was subsequent soldier settlement. Lake Colac is fresh water. Salt harvesting was carried out at Lake Beeac. Lake Corangamite is highly saline. Westwards, beyond Pirron Yallock, stony rises, famous for stonewall fences and rabbits, are conspicuous. The lakes are a compelling feature of the landscape and can be viewed from Red Rock Hill near Alvie. The shire was crossed in a generally westerly direction by the Princes Highway and the Westcoast railway line (through Colac) and by the railway line to Ararat and the Hamilton Highway (through Cressy). Railway lines north and south ran to Alvie, Cressy and Beech Forest. They closed during the 1950s-60s. On 23 September 1994, the shire, Colac city, Otway Shire and a small part of Heytesbury Shire were united to form Colac-Otway Shire. In 1994 farming occupied 79% of the shire's 1458 square kilometres. Livestock numbered 174,800 sheep and lambs, 58,950 dairy cattle and 37,800 meat cattle. 11,280 tonnes of potatoes were harvested. Alvie, Barongarook, Beeac, Colac, Coragulac, Cororooke, Cressy, Dreeite, Elliminyt, Irrewillipe, Larpent, Nalangil, Ondit, Pirron Yallock, Swan Marsh, Warrion and Weering entries.